Not since the release of the first Harry Potter movie have I been as excited about a page to film adaptation as I was about Suzanne Collins Hunger Games. For months, I watched and re-watched trailers and interviews and read every article in print or online that I could find, hoping to get a feel for what the final product would be like. I saw The Hunger Games on opening day, contributing to the record breaking revenue it drew: $68.25 million. Visually, I wasn’t disappointed…for the most part. The film was shot mostly in North Carolina and the forest scenery is beautiful. Jennifer Lawrence, Josh Hutcherson and Liam Hemsworth make a believable Katniss, Peeta, and Gale, respectively, minus the appearance of any real hunger. The poverty and near famine of District 12 is only alluded to in the film. Only readers of the books will have any sense of the “hollow days” Katniss describes when she’s so hungry that nothing she eats can fill her. 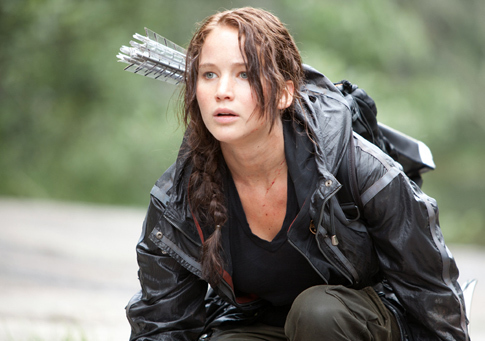 Jennifer Lawrence looks athletic in the film, and I wish just a bit more could have been done to downplay that. I’m not talking about anything as freaky-deaky as the hideous transformation of Bella Swan in the first Breaking Dawn, (incredibly over-the-top and off-putting, in my opinion) merely a little something to emphasize how truly difficult life in the Seam is for Katniss and her fellow citizens of District 12. As with any screen adaptation, details of a story painstakingly laid out in several paragraphs or pages must be skimmed over or cut completely. As a huge fan of the Hunger Games trilogy, this was difficult for me to accept, largely because I believe that director Gary Ross didn’t do it well. The movie opens with barely enough details given to figure out the who’s and what’s of the storyline. There is virtually no character development of Katniss’s mother, Gale or Haymitch, leaving them and their actions flat and unrelatable. The tension of the Katniss/Peeta romance is missing as well. In the book, the reader experiences Katniss’s shifting emotions towards Peeta and her ever uncertainty about his motives, but the film misses this opportunity just like many others. Readers of the Hunger Games come away with a sense of the sheer terror and devastation of Collins’ dystopic world at the end of the books. The violence and carnage of the Games is mostly only suggested in the film. The shots are fast--it’s often unclear who killed who. It's a style probably adapted to soften the sting of a story with a theme of kids killing kids, but the editing is so fast that it’s hard to focus. The results are action scenes that feel blurred. These calculated moves helped to earn the film a PG-13 rating. Suzanne Collins served as a co-author of the screenplay. As a result, the movie version of her best-seller follows closely to the novel’s action sequences. What’s missing is all the character. I came away from the theatre sure in the fact that I could probably count all the lines of dialogue on my fingers…well, maybe my fingers and toes. This is one instance where I believe a fresh approach could have salvaged the heart of the story. Sometimes when you’re too close, you can’t see the forest for the trees. And there are a lot of trees in Hunger Games. Readers of the series will have the benefit of details the movie leaves out, but I’m afraid that newcomers won’t have a real appreciation of the senselessness of the killing rituals televised to the masses. There are already many reviews for this movie out there. I was astounded by how many of them began with something like, “I haven’t read The Hunger Games, but…” Almost every one of those reviews proceeds to tear down the movie. I even saw one that criticized the fact that there wasn’t much “animal life” in the woods that make up the game setting. The goob didn’t get the fact that the woods in the Game are actually part of a constructed and highly controlled arena. I’d like to karate chop some of those buttholes in their throats. Overall, I liked the movie. I’ll probably be seeing it again in the theatre, in hopes of catching anything I missed in some of the busier, dizzying action scenes along with one more chance to gawk at the strong and sorrowful young men that love Katniss Everdeen almost as much as I do. How many of you have seen the movie? What did you think about it? I’d love to hear your thoughts. I decided yesterday that I’d better make a post for March before Secretary of State Hillary Clinton sends out a search party for me like she announced she’s doing for Amelia Earhart this week. I haven’t been up to anything nearly as grand as the late Ms. Earhart for the last several weeks, merely trapped in the abyss of addiction to Words with Friends and his evil twin Hanging with Friends. These games are the crack of apps. I read, ahm on-line from my phone, recently that “All it takes to be a writer is 3% hard work and 97% staying off the internet.” True dat, I guess, though I’m sure there’s a bit more to the equation if one is aspiring to be not only a writer, but published author/decent parent as well. For now, I’m off the juice. I’m taking one day at a time and resisting the urge to start up half-a-dozen games or more at a time with random strangers. I’m trying not to fantasize about “Z” word combinations overlaying triple letter and triple word tiles, trying not to feverishly google the definitions of words like QI and FEH merely to use them to taunt my opponents in the “chat” box, trying to ignore the phantom trill my pusher emits when it’s “my turn” one hundred times per day. I hope that in time he’ll be able to forgive me.